Poor rack cable management has proven to many data center operators to be a source of downtime and frustration during moves, adds and changes. It can also lead to data transmission errors, safety hazards, poor cooling efficiency, and a negative overall look and feel of the data center. 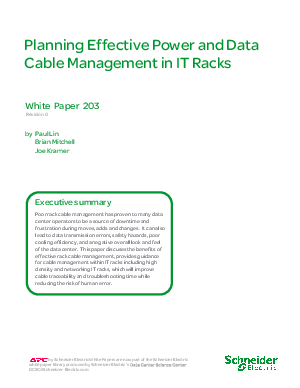 This paper discuses the benefits of effective rack cable management, provides guidance for cable management within IT racks including high density and networking IT racks, which will improve cable traceability and troubleshooting time while reducing the risk of human error.